Approaching ski season, many of us begin to agonize over the question: «Where can I spend my winter holidays, and where can I go this winter in search of adrenaline, snow and ski feast?» Many of you have probably heard of the tiny Swiss town of St. Moritz, lost in the depths of Switzerland on the banks of the lake, set between towering walls of majestic Alps. St. Moritz is one of the most exclusive ski resorts in the world, which is also called the «Top of the World». A lot of people have heard about this place, but what exactly do we know about St. Moritz? What is it and what do you need to know about the place where celebrities come to relax? So we decided to interview someone who knows firsthand about skiing in St. Moritz and all its intricacies – an A-category instructor of alpine skiing, as well as an instructor of Russian National League of Instructors – Mr. Tomass Marnics. – Thomas, during all years spent in the same place, have you ever had a desire to go to other beautiful places? In my opinion, St. Moritz is an amazing place, you know. Many people know only «one side of the coin». Yes, perhaps, it is one of the most elite resorts in the world, with wide choice of luxury hotels, boutiques, expensive restaurants and its own small airport. But besides all mentioned above, there are splendid groomed pistes, great ski areas for freeride lovers, many tourist attractions, all sorts of alternatives for outdoor activities, as well as about 320 sunny days a year here, in St. Moritz! St. Moritz is one of the oldest resorts in the world. Two Winter Olympics (1928, 1948), several world championships in alpine skiing were held here. Also St. Moritz is the birthplace of the sports of bobsleigh, toboganning and skeleton. On the piste, located near the town center, the World Cup stage and other significant competitions in bobsleigh, tobogganing and skeleton are annually held. One unique feature of the piste in St. Moritz is that it`s the only natural piste in the world, which is newly formed every winter. Besides, a famous Engadin Skimarathon, that gathers athletes from around the world, is held here, as well as Women Alpine skiing World Cup. There are many cultural events, such as Jazz Festival, ice-polo and various exhibitions in the town. In short, it is never boring here. – Tell us about skiing in St. Moritz. Sure, you know almost everything about the potential of this region. You're quite right saying that potential of this region is large enough. But first things first. 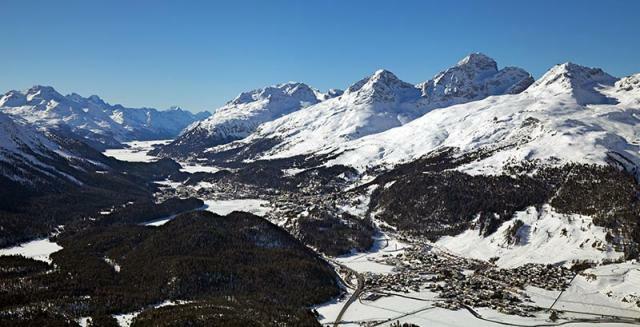 There are three main ski areas around St. Moritz: Corviglia, Corvatsch and Diavolezza. The first two areas are the most popular among the tourists. Corviglia is a favorite ski area among tourists. Everything is conveniently located here: lifts start right out of the town, a large number of restaurants on the slopes, a broad range of pistes of varying difficulty, a park for freestyle fans, music and fun. Almost all the pistes are on the southern slopes that means plenty of sun in good weather. As you know, St. Moritz is famous for sunny days (about 320 a year), so at the Corviglia pistes you feel constantly the holiday atmosphere. No wonder that the Women Alpine skiing World Cup stage is annually held on this side of the valley. It is a big day in the world of skiing. There are also many easily accessible off-piste routes that are visible from the ski lifts. That’s where the fans of skiing and snowboarding can try to make their first steps in the art of off-piste. Corvatsch is another ski area, which undoubtedly will please anyone who loves skiing. This area is more suitable for those who love to ski, but not to sit in restaurants. There are far fewer restaurants here, while pistes are more interesting, relief and designed for those who already know how to ski. There are few people here, as a rule, this is due to more complex pistes and relatively small amount of sun. Corvatsch is a great place for off-piste skiing. There is a big choice of different couloirs, drop-slopes, snowy fields and pistes for real professionals in freeriding. This is the place where freeride and freestyle competitions are annually held. Only the fact that in 2011 the stage of World Freeride Series was held here indicates the complexity of the local relief. This area is rich in northern slopes, so you can always find fluffy and soft snow. In January 2014 Russian National League of Instructors, supported by Ski Cool school, is going to hold the off-piste classes here. This place is perfect both for off-piste experts and for those who are just beginning to leave the pistes. In my opinion, the place is really worth seeing, even if you like to ski on groomed pistes. Diavolezza. This ski area can be recommended only for those who are already confident in parallel skiing. Diavolezza is a 20-minute drive from St. Moritz, so generally there is a very small number of skiing people. Pistes are complex enough, steep and very beautiful. This region is surrounded by huge mountains of about 4000 meters height a.s.l. Abundance of towering peaks, blue glaciers and lack of skiers – that's what makes this place one of the most beautiful regions of the entire canton of GraubÜnden. There is also the longest marked down-run in Switzerland – Diavolezza glacier run, which takes about 45 minutes. The way from the top through the Munt Pers Glacier Morteratschgletscher past amazing ice formations, ends in rail road station Morteratsch, whence you can return to the main lift Diavolezza area by taking a train. Well, there are slopes for outstanding off-piste here, often standing idle. Besides these 3 great ski areas, there are also some places with lifts in the region, but they are exclusively for masters of off-piste, and I can tell about these places in person only. – Are there secret places? It is rather a place for the good of your soul. Places where I rest from my work and take my mind off of everything happening around. Although I can’t say that I’m very tired of my job. Of course, sometimes I’m physically drained, but I like to teach people and share knowledge I possess and get on different training courses. – Do you mean there is still room to grow? And is there a limit? There is no limit. Borders exist only in our head. In skiing, constantly improving technology, there are nuances and some points that allow athletes to go faster, more confident and stable. Even the most famous skiers train constantly, working on their technique and mistakes. Even the greatest champions including champions of the Olympic games and World Cups have mistakes pointed out by their coaches which they constantly correct. So I’m always surprised by phrases like: «I know how to ski, I do not need an instructor».If a person believes that he already knows everything and there is nothing more to learn, it is the first sign that he does not develop and degrades. In this case we are talking about the ability to ski. The question is rather what you can do and how you do it. Because you can do it even better – there is no upper limit. For example, Ski Cool (the place I work for) is the only school in St. Moritz training using UPS system. This method of teaching was invented by a well-known Slovenian coach Sandi Murovec. It is that with the help of special equipment – skis of different lengths – as well as using special exercises, a person who has never seen snow can be put on parallel skis. This system is good because it is suitable for both beginners and experts, as there is own set of exercises for each level of training. World Champion in 2011 and 2013, twice vice-champion of the Olympic Winter Games 2010, four-time world vice-champion, the winner of overall World Cup 2012/13– Tina Maze – trains using this system. So as you can see, there is no limit. – And this all can be learned in St. Moritz? Yes, you can learn many things, giving the will. And that’s why ski schools and teaching methods exist. Our school employs many good instructors, so come if you got interest. Let’s ski and learn together!